Simplify the shipment and presentation of your business and calling cards and even your business stationery by ordering Stationary Set Up Cartons. 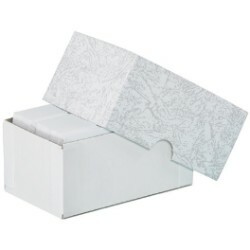 These two pieces of cartons are designed to be durable made from fiber board and can accommodate business cards and other related business cards and papers. The covers for our stationary cartons are wrapped using gray leatherette paper for better durability and of course for design purposes. These stationary set up cartons are also available in different sizes which means that you can accommodate all your business cards of different sizes. Some of the popular sizes that we carry include 3 3/4'' x 2 1/4'' x 1 3/4'' Stationery Set-Up Cartons, 4 3/4'' x 3 1/2'' x 2'' Stationery Set-Up Cartons, and 6'' x 3 1/2'' x 2'' Stationery Set-Up Cartons. These cartons are available for bulk orders. Great for offices and organizations that want their employees and officers take control of their stationery and business cards.